The time currency application developed at the Wales Institute for Community Currencies (WICC) by Geoff Thomas, advocates time banking as a mutual mechanism to advance citizen engagement. 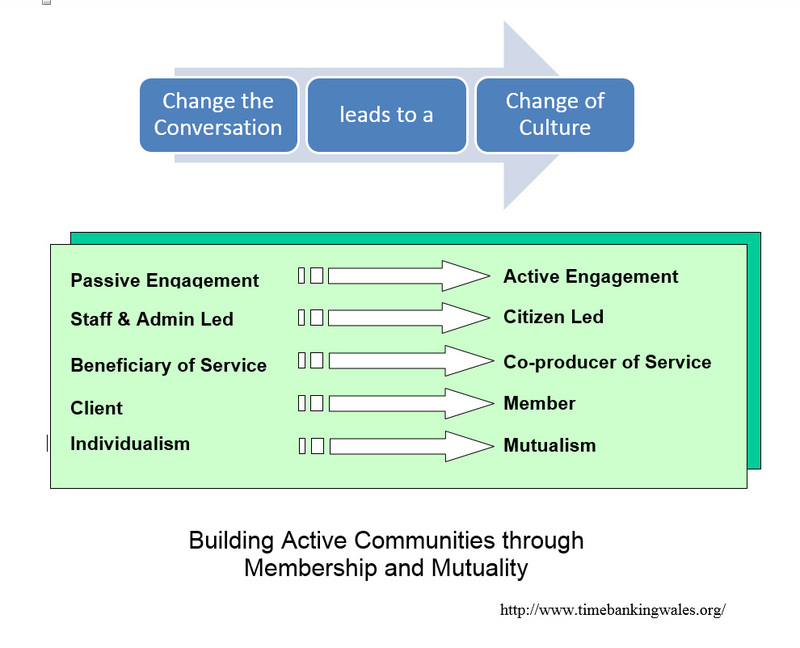 The challenge for agencies and social activists is how to rebuild active creative communities – to finance and revitalize the involvement of citizens in communities by addressing new ways to replenish the diminishing stock of positive social capital. Geoff’s model using Person to Agency Time Banking primarily rebuilds the relationship between community and agencies. Community organizations invite community members not to be passive recipients of community services, but to help actively deliver them, to run the community cafes, to transfer learning, to run support groups, after school clubs, bingo nights and comedy events. Welsh timebanks work a little differently to the traditional timebank model in that they are ‘hosted’ within public and community agencies. Community members are then invited to actively engage and take ownership of public services rather than being passive recipients. The ‘host’ agency acts as the central bank and acknowledges members for their time with credits. These credits can be spent and used at Time Out venues to access social, cultural and educational activities on a quid pro quo hourly basis. For every active hour that a community member ‘gives’ to the community organization is an hour which can be used to access community events, trips and services. The results are dramatic, levels of active engagement rapidly increase, negative social problems decrease and the negative cycles of dependency and inactivity begin to unravel.